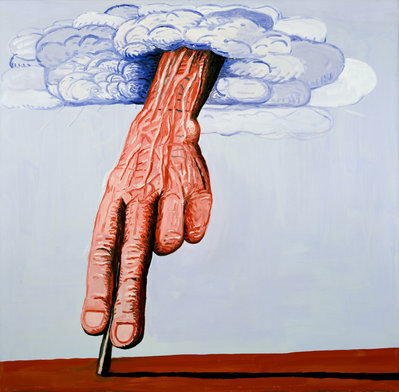 The courageous and quite extraordinary oeuvre of US painter Philip Guston (1913–1980) was one of the most controversial of the age. He was the first painter to return to figuration in the post-War era and was quite pioneering in linking high art and images from popular culture, so that today many celebrate him as the trailblazer of postmodern, figurative painting. In 1950, though self-taught Guston earned his spurs in the New York art world as defined by Jackson Pollock, Willem de Kooning and Mark Rothko, and emerged as one of the major champions of Abstract Expressionism. 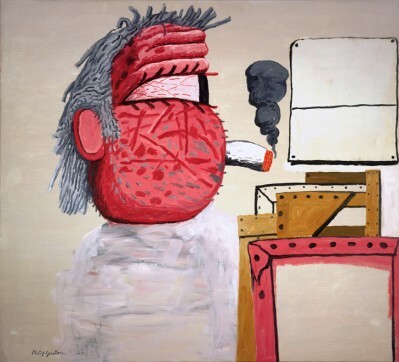 At the end of the 1960s, he embarked on an intense phase of drawing, something that culminated in his breaking away in painting from the “purity” demanded of abstract art: Guston introduced coarse figures and fragments of figures into his works; they populate his pink, red, black and blue canvases, smoking, drinking, and not infrequently painting. Large heads, severed hairy legs, clumsy shoes, and all manner of architectural fragments such as walls, doors, and lamp bulbs are among Guston’s themes, which are reminiscent of 1920s comics. The first exhibition of these paintings, with their anarchic sense of humor and feel for the grotesque, was in 1970 and caused a veritable scandal, as many critics accused him of “betraying” abstract art. To mark the 100th anniversary of his birth, the SCHIRN is currently honoring Philip Guston with an exhibition boasting a concentrated selection of some 40 works from what was his most exciting period, showing how they form a milestone in American painting.